It's hard to believe that twenty-five years have passed since DC first released The Death Of Superman - a story that has been adapted more than a few times since its initial debut back in 1992. Now, there is another one. Screened at San Diego Comic Con, and landing at retailers today, the newest version serves as the latest entry in the popular collection of DC Animated Original Movies and kicks off a story set to continue next year in Reign Of The Supermen. While we'll admit that The Death Of Superman is a story that has probably gotten more than it's fair share of adaptions since its initial release, we'll also admit that this newest version is the best one to date! The new feature sticks much closer to its bestselling namesake than either 2007's Superman: Doomsday or 2016's Batman v Superman: Dawn Of Justice did, and we're certain fans of the original book will appreciate that. As it serves as the first part of a two part tale, this new version of The Death Of Superman feels a lot less rushed than those that have come before it, and does a nice job of flushing out the majority of the characters featured throughout and building up to the eventual confrontation between the Man Of Steel and Doomsday. Granted, we've seen most of this stuff on more than one occasion, but this new take feels much truer to the source material. Now, that's not to say that this new version is without its flaws, because this is simply not the case. We've been transported to this DC Animated Universe over ten times since it kicked off in 2014 - with each movie featuring the exact same voice cast to maintain its continuity -but, it does seem a little odd that Clark and Lois are only dating now. Additionally, the relationship between the two does seem a little rushed, and it is a little disappointing that the overall weight of the relationship being taken to the next level isn't really felt here. However, we also understand that this is not the main focus of the film's plot. So, we're willing to let that slide. And we've no doubt things will be expanded upon in future films down the road now that Lois has learned the truth of who Clark Kent really is. Additionally, the overall death of Superman doesn't really have a whole lot of time to sink in before the movie begins setting up for the upcoming sequel. Still, it does do a nice job of laying the groundwork for what's to come, and has us very excited for what's to come. Now, while the movie is not without its flaws, there is still a lot to love about The Death Of Superman. For one thing, animation is absolutely gorgeous - and the overall skill of the artists really shine through during the fight with Doomsday! It's both beautiful and bonkers in its entirety, and we really loved the addition of the Justice League this time around. The film also does a very nice job of capturing the sheer level of destruction during the battle, and we've yet to find an adaption that showcases the severity of the beatings these two take quite like this one. This new version clearly wants to immerse fans and newcomers into the fight within like never before, and it pulls this off in an extremely satisfying way! At the same time, we must take a moment to credit the stellar voice work present throughout this animated feature! As we mentioned above, this film features many of the same voice talents that we've heard over the last few years, and each returnee brings their big game once again! But, it's the newcomers to this universe that really shine during the duration of the movie! 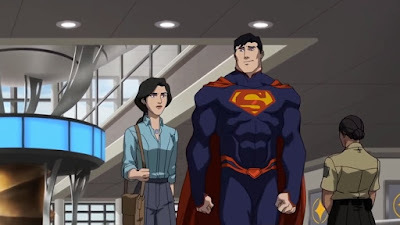 Rebecca Romijn really does an excellent job embodying the relentless determination of Daily Planet reporter Lois Lane, and we look forward to seeing more of her next year in Reign Of The Superman. 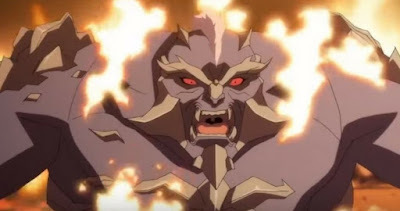 We also really enjoyed hearing Nyambi Nyambi in the role of Martian Manhunter, and Black Lightning leading man Cress Williams as John Henry Irons. However, it is Rainn Wilson voicing the villainous Lex Luthor that really shines here. Wilson really does a great job of tapping into the squeaky clean sleaziness of the longtime Superman foe, channeling more than his fair share of Dwight Schrute meets Gene Hackman to pull it off! 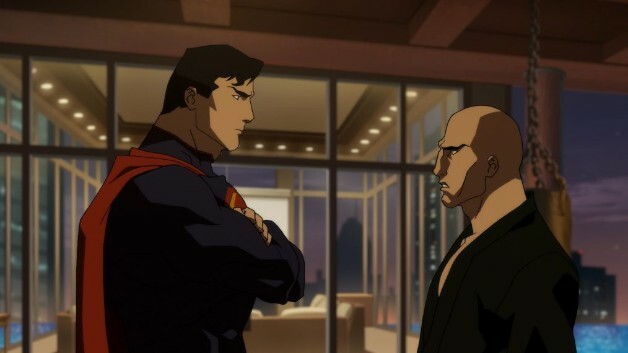 We'll be honest in admitting that when the voice cast for this film was announced this past spring, we scowled upon learning that Wilson would be voicing Lex Luthor. However, he did an excellent job in the part - particularly during the character's boastful rant while throwing down with Doosday - and we can't wait to hear more of him down the road. So, to sum things up, we've seen this story many times over the last decade. Still, The Death Of Superman does the best job yet taking the legendary book and transisitoning it to a new medium. 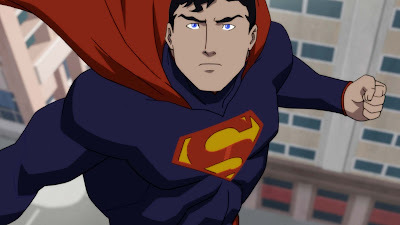 There really aren't a whole lot of surprises here, but if you're looking to watch a version that expertly captures the sheer brutality of Superman's greatest fight, features beautiful animation and a stellar voice cast, then this is the version for you! Granted, it's not perfect, nor without its flaws. However, The Death Of Superman is an expertly crafted take on the classic tale certain to affirm that you can always count on Superman! We thoroughly enjoyed this flick, and can't wait to witness the second part when Reign Of The Superman arrives next year. And we're sure you'll love it too! The Death Of Superman is available on Blu-Ray, DVD and Digital HD now! Special thanks to Gary Miereanu for making this review possible.